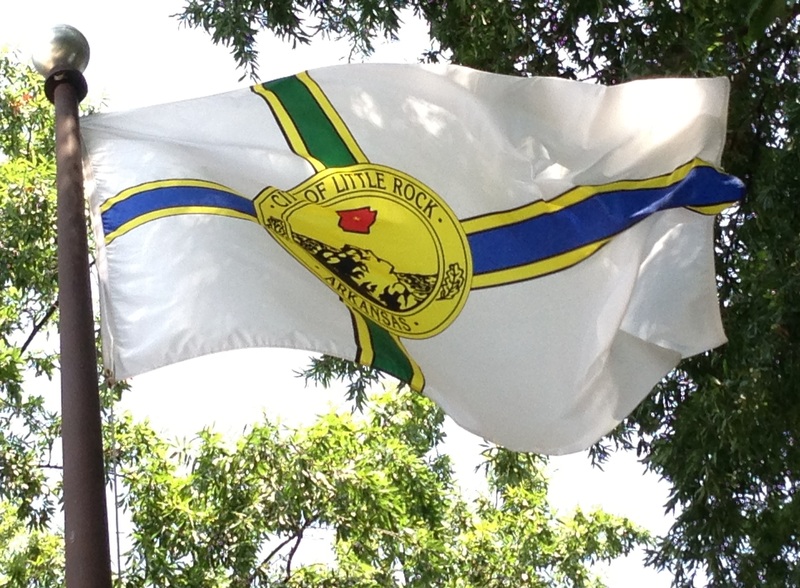 On October 18, 1988, the City of Little Rock Board of Directors adopted the first official flag for the City of Little Rock. The adoption of Ordinance No. 15,566 was the culmination of a design competition which had been spearheaded by Little Rock City Director Sharon Priest (later Little Rock Mayor, Arkansas Secretary of State and Executive Director of the Downtown Little Rock Partnership). Prior to the Official Board of Directors meeting that day, a press conference was held in the Little Rock City Board Chambers for presentation of the City’s flag. The City Beautiful Commission, a commission of the Department of Parks and Recreation, sponsored a the contest which received a total of fifteen flag designs. The flags were judged October 12, 1988, by City Directors and City Beautiful Commission Members. Director Sharon Priest presented the winning flag and introduced David Wilson, a law clerk at the Mitchell Law Firm, who designed the flag chosen for the $1,000 first prize. The second-place winner was Craig Rains, who received $500; and the third-place recipient was David Tullis, who received $250. The flag was adopted by the City Board that night by a 6-0 vote; former mayor and current director Charles Bussey was absent. Those voting to adopt the flag were Mayor Lottie Shackelford and directors Sharon Priest, Tom Prince, Buddy Villines, Buddy Benafield and Tom Milton. Priest would be a future mayor while Prince, Villines and Benafield had all served as mayor. As the official flag of the City of Little Rock, its symbolism is described as follows: A clean white background of the banner represents the optimism and open potential that the city has to offer. The royal blue horizontal broad stripe symbolizes the Arkansas River which borders Little Rock, and has served as an economical and historical emblem since the city’s beginning. The forest green stripe runs vertical to the royal blue stripe, creating a cross which symbolizes the location and statute of Little Rock—a city serving not only as the crossroads of Arkansas, but a crossroad of the mid-southern United States as well. The strong forest green color depicts the fields, parks and forests which contribute to the natural beauty of the city. The seal of the flag is a modernized adaptation of the current Little Rock seal. The razorback red silhouette of the great State of Arkansas shows her capitol, the City of Little Rock, represented by the centered star. The star rises directly above “The Little Rock”—the protruding cliff along the Arkansas River, which was discovered in 1722 by French explorer La Harpe, when the city was given the name. The Arkansas River behind the rock and the symmetrical oak leaves in the border of the seal are a stylized illustration of what the flag’s stripes represent—the natural beauty of the city. Finally, the gold color of the seal and bordering stripes symbolize the superior economic history, and the future economic potential that is available in the City of Little Rock, Arkansas. Future Little Rock Mayor Tom Prince was born on August 13, 1949. After graduating high school in 1967 (where he was on the state championship golf team), he attended the United States Naval Academy. He later received his law degree from the University of Arkansas at Little Rock and began practicing law in Little Rock. In 1984 he ran for the City of Little Rock Board of Directors and was elected. In January 1985, he was selected by his fellow City Directors to serve as Mayor of Little Rock. 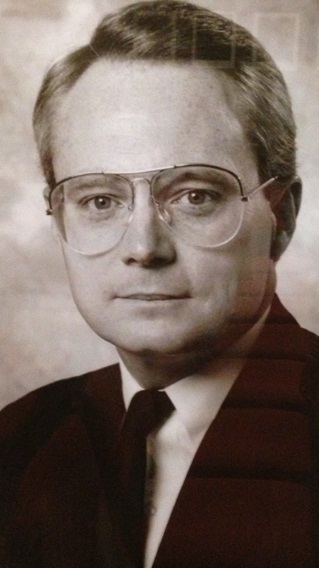 He served as Mayor until January 1987. During his term in office, Arkansas celebrated its Sesquicentennial. Mayor Prince oversaw the City’s participation in the celebratory activities. As Mayor he was also a strong advocate for expanding the city’s involvement in quality of life issues through enhanced parks and arts while maintaining a commitment to public safety and public works issues. After the completion of his four year term on the City Board, he did not seek a second term. City of Little Rock races are non-partisan. After leaving office, he became involved in Democratic Party politics. In 1992, he campaigned for Bill Clinton’s presidential bid in Iowa and other Midwest states. When his law partner, Sheffield Nelson, ran for Governor in 1994 as a Republican, Prince resigned from his Democratic Party positions and worked on the Nelson campaign. In 1997, he was elected chair of the Pulaski County Republican Committee. In 1998, he ran for the United States Senate as a Republican. In 1999, Prince experienced a family tragedy and took a sabbatical from practicing law. In 2000, he moved to St. Louis to become general counsel for a securities firm located there. Following several years with the securities firm, he joined a St. Louis law firm in private practice. After spending over a decade in St. Louis, Prince returned to Central Arkansas and is managing business interests. The adoption of Ordinance No. 15,566 was the culmination of a design competition which had been spearheaded by Little Rock City Director Sharon Priest (later Little Rock Mayor, Arkansas Secretary of State and now Executive Director of the Downtown Little Rock Partnership). In 1999, Prince experienced a family tragedy and took a sabbatical from practicing law. In 2000, he moved to St. Louis to become general counsel for a securities firm located there. Following several years with the securities firm, he joined a St. Louis law firm in private practice. He remained in private practice in St. Louis through 2012. A St. Louis Business Journal profile of Prince in 2010 highlighted his interests in single action shooting and in horseback riding. The flags were judged October 12, 1988, by City Directors and City Beautiful Commission Members. Director Sharon Priest presented the winning flag and introduced David Wilson, a law clerk at the Mitchell Law Firm, who designed the flag chosen for the $1,000 first prize. The second -place winner was Craig Rains, who received $500; and the third -place recipient was David Tullis, who received $250.